Chocolate and vanilla cake comprising of vanilla with streaks of chocolate. It may be made with or without eggs. 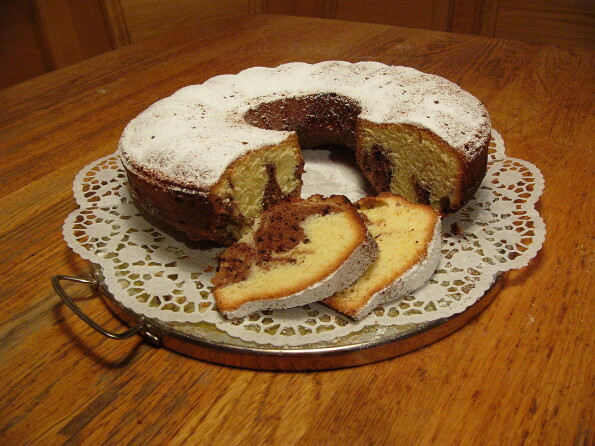 Marble cakes originated in Germany during late 19th century and quickly gained popularity all over the world including Asian countries like India, Pakistan and Malaysia. Here’s the recipe to make delicious marble cakes at home. Preheat oven at 180 degrees Celsius and lightly grease a baking tin; also line it with a parchment paper. Beat butter with caster sugar in a bowl with electric beater until light and fluffy. Gradually stir in milk and vinegar then finally fold in flour and baking powder gradually. Reserve 1 tablespoon flour for later use. Divide the batter into two halves. Add reserved flour and vanilla extract in one half and 1 tablespoon cocoa powder in other half, stir gently both mixtures in separate bowls until smooth. Pour alternate spoons of both batters into prepared baking tin creating layers and bake for 25 to 30 minutes or until nicely baked and a toothpick inserted at the center comes out clean. Bring out of the oven and let it stand for 10 minutes. Then unmold and cool it completely on wired rack. Combine all ingredients for icing in a bowl and stir well. Reserve some icing sugar for sprinkling. Spread icing all over the cake with the help of a palate knife and sprinkle reserved icing sugar on top. Refrigerate for a couple of hours to chill and set the frosting. Bring out of refrigerator just before serving, cut into slices and serve. Tip: You may add some chocolate chips or candied fruits also in the batter before baking.